In my last two posts, I discussed the devotional activities the Latin Mass Society organises, and our training and educational initiatives. 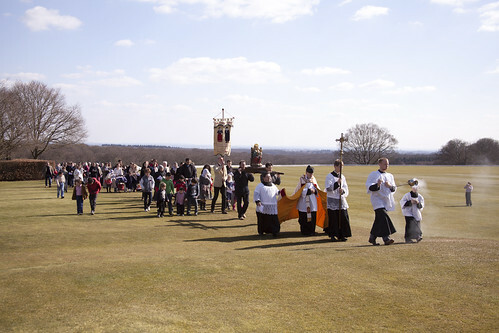 These represent a whirlwind of events: there is always something happening, or about to happen, over and above the more routine matter of supporting the celebration of the Traditional Mass week by week in parishes, which is of course a ball we can never allow to drop. But there is another aspect of our work which is also necessary: research and campaigning. The liturgical restoration will not take place without the right side winning a number of arguments, and not without drawing facts and arguments, including the facts of the Church's law, to the attention of the Catholic public and, on occasion, of the hierarchy. If you like what we do, then show your support by becoming a members of the LMS. 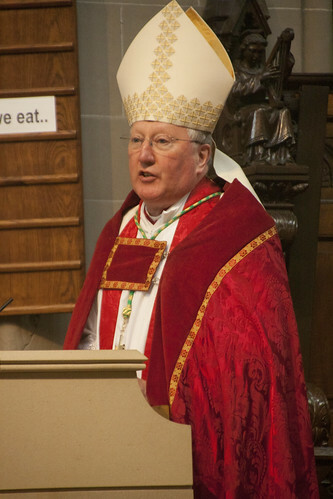 If seminarians are all taught and accept that Latin is a barrier to participation in the liturgy, that the priest celebrating with his 'back to the people' symbolises contempt for them, and that Chant should be rejected because it is too difficult for congregational singing, things are, quite simply, never going to improve. In point of fact seminarians are today increasingly not being taught these old orthodoxies, and they are increasingly rejecting them, because the liberals have lost the argument on these issues. The work of Pope Benedict, as a private theologian as well as his teaching as Pope, and that of a large number of young scholars, have made the old arguments untenable. The old orthodoxies retain their grip on those who have not caught up with the latest thinking, however, and continue to damage the prospects of restoration. 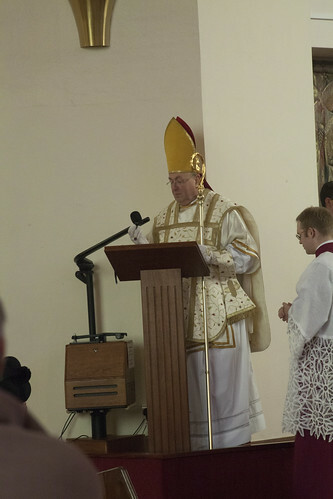 When a priest suggests celebrating ad orientem, for example, he is likely to be met with opposition from the Faithful based on just those old arguments. Those ideas need to be exposed, held up to the light, and refuted, again and again and again, until the message gets through. 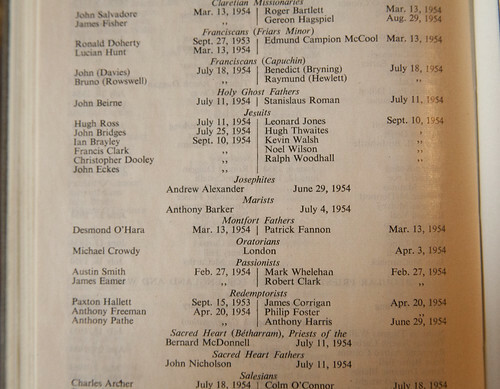 Nearly 14,500 adult conversions in 1960. It's about of third of that now. This needs to be done not with angry polemic, nor with sloppy arguments from dodgy websites, but with charity, care, and scholarship. This is the thinking behind a major project of the International Federation Una Voce which has been taking up a great deal of my time over the last 18 months, as the official coordinator: the Position Papers. We now have 16 published, and I will soon be making public numbers 17 and 18. They are highly compressed, heavily footnoted, executive summaries of the arguments needed by those engaged in any kind of serious debate. No one on the internet can any more have any excuse to wheel out the old liberal canards, the discredited scholarship of 60 years ago which once seemed so daring and so unanswerable. That, of course, is exactly what people in the Catholic press like Mgr Basil Loftus do: week after week, he recycles his old notes from 1963 as if he were delivering to his readers the latest research. There must be someone equally relentless to show it up for the nonsense it is. Because most Catholics are not liturgical scholars, and if they hear it from a Monsignor with a big column in a Catholic newspaper, they will give it the benefit of the doubt. So this blog itself has some role to play. But to take the battle, not so much to the enemy as to the unconverted, I and other Latin Mass Society people regularly get letters and articles, as well as news reports, into the press. If we didn't exist, if we weren't supported by our network, if we didn't have expertise to call on and volunteers to help with research, and if we weren't given some standing by the fact of our representing a large organisation, this would be impossible, and the traditional and conservative point of view would be vastly less well represented and less well argued in the UK. In the year or so after the Motu Proprio, letters to the Catholic Herald pointing out the bleedin' obvious seemed to be necessary practically every week. It has been quieter since then. In the last twelve months I've had only five letters published in the Catholic Herald, and a feature article; I've had two letters each in the Universe, the Catholic Times, and the Tablet, and done a guest post on the Tablet blog. I have spoken to four different sets of journalists on various stories, and contributed a short story to Oremus, the Westminster Cathedral magazine, and pieces for Te Deum Laudamus, and The Latin Mass Magazine. 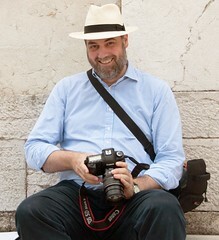 I have also been interviewed for the on-line Regina Magazine and (bizarrely) a Polish radio station. To repeat: it is the Latin Mass Society which makes this possible. A good illustration is the research we did on the number of ordinations over the decades. 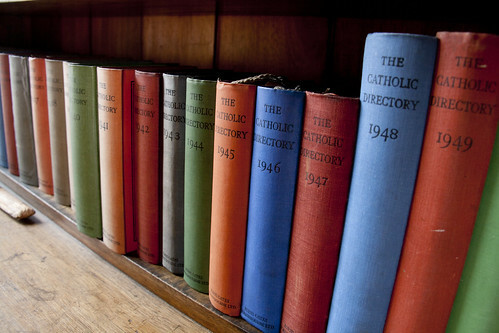 Having seen some dubious claims being made in public, we are able to put a team of volunteers (including me) into one of the very few places in the country with the entire set of Catholic Directories, and get the necessary research done in a couple of weeks. The work we did took many, many man-hours, a bit of money, some good friends and some zealous supporters. The Latin Mass Society had the will and the means to do it: if we hadn't it wouldn't have happened. 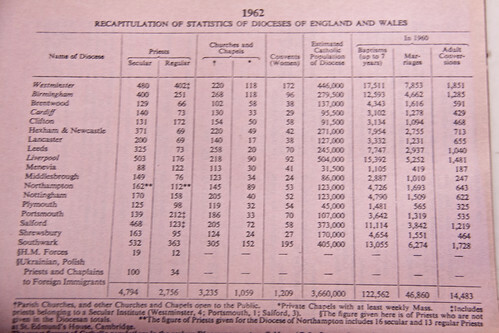 And the idea that more priests were ordained this year than in the 1950s would probably still be out there in public. A different kind of campaigning goes on behind closed doors. We enjoy good relations with the hierarchy, at the human level, and we always have, despite our disagreements. 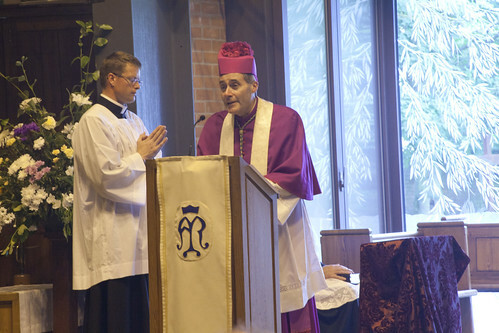 Over the last year or so Mass has been celebrated for us by Bishop Hopes, the new Bishop of East Anglia, Bishop John Arnold, an auxiliary Bishop of Westminster, and Bishop McMahon in his own diocese of Northampton. Bishop Drainey of Middlesbrough and Bishop Davis of Shrewsbury have been present at our Masses, a couple of years ago Archbishop Longley of Birmingham was. We talk to and exchange letters with bishops both in relation to matters in their dioceses and in relation to their responsibilities in the Bishops' Conference. We are also in touch with a good many different persons and departments in Rome. This kind of thing is only possible if you represent some organisation with some kind of standing, if there is continuity over many years, and if you have some kind of office support. No lay person, no priest, could keep this kind of dialogue up consistently. We can do it, not because we are heroes, but because there is a structure to keep it going. Something else we have is a database: of priests who say the Extraordinary Form, and of laity who want it. On several occasions in the last year or so we have had non-public campaigns which have involved getting in touch with large numbers of priests or, in a particular part of the country, with our lay supporters, to seek their views or support for a specific initiative. These tasks used up enormous amounts of office and volunteer time, and they would have been simply impossible without our network of supporters, our database, and the administrative support the Office gives us. We are probably never going to get any public credit for these things, but if you'll take my word for it they were important and successful. If the Latin Mass Society hadn't existed, these things would not have happened. Does the Latin Mass Society do anything useful? Yes, we do. If you are at all interested in dealing in a positive way with the aftermath of the 'collapse of the liturgy' which Pope Benedict spoke about as Cardinal Rarzinger, then it must be pretty difficult to say that we don't have a positive role to play. We can't do this without support. Forget your prejudices about not wanting to join things, or about what happened twenty years ago, or whatever it is which stops you joining, and join the Latin Mass Society! The families that Stuart Reid doesn't think exist in the Traditional movement, at the Family Retreat.